Ayyam Gallery Dubai (DIFC) presents Distorted Reality, a solo exhibition by multidisciplinary artist FAISAL SAMRA. Distorted Reality presents works from the artist’s photographic series of the same title. The photographs on display are documentation of a series of performances by the artist, whose identity is concealed by intricate costumes and head coverings, as well as other objects. In these works, Faisal Samra is shown struggling to break free; capturing his movement, the camera provides a visual documentation of the sequences of his actions, which are improvised and executed against a predetermined backdrop. The resulting digital prints are reminiscent of early twentieth-century experiments with moving images, in which each frame shows sequential movement, yet within the context of today’s mass media dominated visual culture, the series articulates a rebellion against the burden of representation. The violence of Faisal Samra’s gestures is blurred when digitally captured, resembling a state of transfiguration. This series describes the insidious nature of technology and the burden of representation that has emerged with the proliferation of visual media. As we are bombarded by images, the artist argues, our identities absorb the assault. Active since 1975, Faisal Samra is one of the region’s most experimental artists. Often employing several media in a single artwork, his successive projects have focused on what he describes as ‘finding solutions to a visual problematic,’ what might also be understood as an ongoing breakaway from aesthetic conventions. Samra’s early works, for example, demonstrate his initial interest in surpassing the boundaries of figuration with drawings of subjects that stir despite their stationary positions such as in Quran Reader (1978), which depicts a male protagonist whose body appears to dissolve. Long considered one of the Arab Gulf’s foremost artists and a pioneer of conceptual art in the Middle East, Bahraini-born, Saudi national Faisal Samra incorporates digital photography, painting, sculpture, video, and performance in a creative repertoire that explores existentialist themes with the figure at its centre. Since the mid 1970s, Samra has tested the conventional functions of media through meticulously structured works with experimentation and research as the guiding principles of his artistic practice. As his oeuvre has progressed and defied traditional modes of representation, he has rebelled against his own understanding of art, transitioning into new works that maintain three essential concepts: spontaneity, dynamism, and secrecy. 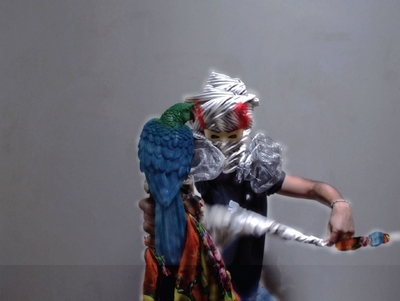 Faisal Samra graduated from the École Nationale Supérieure des Beaux-Arts in Paris, and has contributed to numerous noteworthy group shows such as Word Into Art (London and Dubai), Languages of the Desert: Contemporary Arab Art from the Gulf States (Abu Dhabi, Paris, and Bonn), and Traversée, (Paris, Cairo, Rabat). His works are housed in the collections of The British Museum (London), the National Museum (Mexico City), the Modern Art Museum (Cairo), and Mathaf: Arab Museum of Modern Art (Doha), among others. He has participated in biennials in Singapore (2008) and Cairo (2008), and is a jury member for the Alexandria Biennale, Egypt. The artist’s selected solo exhibitions include Bin Matar House, Bahrain (2015); Ayyam Gallery, Dubai and London (2014) and Jeddah (2013); HD Galerie, Casablanca (2012); Traffic Gallery, Dubai (2011); Albareh Gallery, Bahrain (2010); Galerie Nathalie Obadia, Paris (2009); XVA Gallery, Dubai (2007). Recently, Faisal Samra has participated in collective exhibitions at Sheikh Ebrahim bin Mohamed Al Khalifa Center, Bahrain (2016), Photo London (2016); Low Gallery, San Diego (2016); OFF Biennale Cairo, (2015); Abu Dhabi Festival, UAE (2015); Busan Museum, South Korea; FotoFest, Houston (2014), Edge of Arabia, London (2012); Mori Art Museum, Tokyo (2012); Maraya Art Center, Sharjah (2010).